I LOVE Dragon’s Den. Since the very first series, I’ve always been hooked. I like the successes, catastrophes, business insight and witty quips from the Dragons – Deborah Meadon has always been my fave! 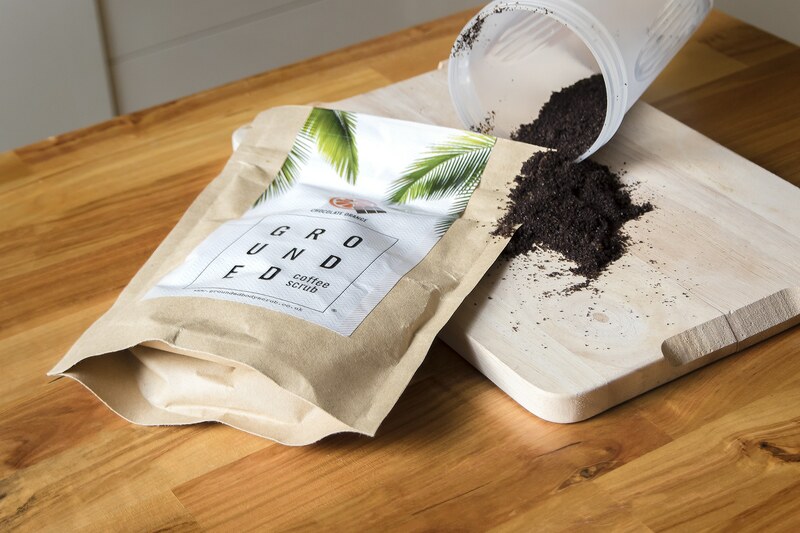 Just after Christmas was an episode where Essex couple Lloyd Hazell and Tasha Harris presented their company Grounded Coffee Scrubs, bringing an Australian beauty buzz to the shores of the UK. After they’d unsurprisingly received their investment, I ran to my computer and ordered a bag; it arrived very quickly and was soooooo worth it. The three scents available are coconut, grapefruit and chocolate orange. The scrub is pretty much completely fresh grounded coffee (this one smelling just like a chocolate orange latte) which when applied to the skin in the shower, buffs away dead skin cells revealing healthy, fresh, new ones. If you like your body scrubs coarse, then this is the one for you. The fragrance is beautiful: coffee and soft chocolate orange. It really needs to be smelt to be believed! Robusta coffee beans, Sucrose (Brown Sugar) Sodium Chloride (Himalayan Rock Salt) Amygdalus Dulcis (Sweet Almond Oil), Tocopheryl Acetate (Vitamin E), Theobroma Cacao (Cacao Oil) Parfum, Limonene, Benzyl Alcohol. 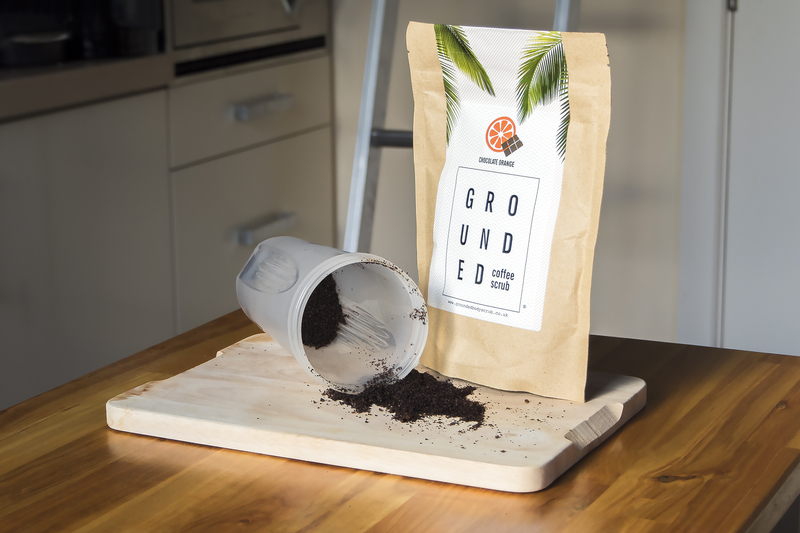 Due to its unbelievable messinness, the grounded coffee scrub is best applied in the shower. Massage generous amounts onto damp skin (I’d suggest before cleansing) and work into the skin in circular motions to remove dead skin cells. Pay particular attention to knees and elbows. As in the photo, I would definitely suggest pouring it into something before use as the bag is paper (with a sealed wallet inside) and I wouldn’t want to risk getting water into the whole product. So, I’ve been using a gym protein-shake cup which works perfectly! Finally make sure you moisturise after use, else those freshly exposed cells will start to dry themselves out. I am loving The Body Shop Cocoa Body Butter at the moment as it’s rich yet non-greasy; perfect for winter! Although the company waxes lyrical about the scrub’s benefits for the face, professionally, I would never recommend this. Although the immediate results may feel great, it’s just too coarse for more delicate facial skin and will cause damage to the fresh skin cells underneath. Keep this strictly as an amazing body scrub. Well, Boots have jumped on this straight away and have already begun stocking it for £15 in their Beauty Finds category. The chocolate orange is available here and the rest of the range here. Alternatively you can check out their own website and online shop here (with free delivery). They’ve also started selling a hair mask and selection of lip balms – yum! This article first appeared on MANFACE written by Thom Watson. It was published on Monday 1st February 2016 and was last updated on Monday 3rd April 2017 at 1:13pm. It's categorised under Exfoliate, Grounded Body Scrub where you'll find more related content.